I threw out a challenge. 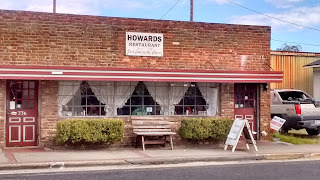 We were in a little restaurant called Howards in Moncks Corner, South Carolina - yes, we'd been to Moncks Corner a couple of years before for a different purpose but this time we had breakfast in mind. The genial owner seated us in the crowded room after turfing out a family, "Git outta here!" They laughed - obviously regulars. We asked for menus. "No menus here - this is home cookin' just tell us what you want." "What I really want, I said, "is British sausages - proper bangers." (Bangers are something I haven't managed to find the length and breadth of America and I doubted I'd find it here). The owner asked for more details, then said, "I'll do my best." Meanwhile his grandmother, Vera, came around with coffee - a sign on the wall was counting down the days to her retirement at age 85. 4 years and a few months to go. Then the sausages arrived and I have to say, hand on heart that, if they were not quite the best bangers I'd ever tasted, they were a darn sight better than any other sausage I'd ever tasted in America and as close as they could possibly be to the real thing. I was over the moon and attacked them with gusto. Meanwhile a chap came and introduced himself. He was originally from Nottingham he said. Well I never. Thank you, Howard, for a lovely experience.